Chives are the smallest of the Onion family. They are also the only one of the onion family that is native to both the old and the new world. The Romans used chives to relieve sore throats and sun burns. They did not use them for eating because they believed that it would increase blood pressure and act as a diuretic. Chives are now known for its mild onion flavor. They are a great option to substitute in place of green onions, and they are perennial and can be easily grown as part of the landscaping in the yard. 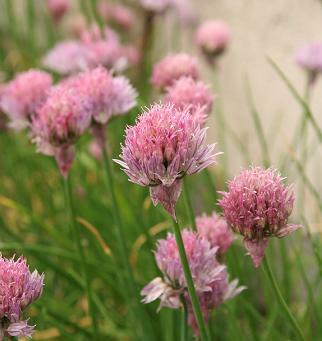 When grown from seed, the chives take about a year before they are big enough to harvest. Knowing that, you can decide if you want to purchase a plant, or start them from seed in your garden. Start seeds outdoors in spring or fall. Transplant chives in mid spring. Allow 6 to 8 inches (15 to 20 cm) between plants. Plant the chives in a spot that they can call home for about 3 years. They are not invasive and make great companions with carrots and tomatoes. After 3 years they will need to be dug and divided. It is great to share your mature divides with friends and neighbors to grow in their gardens. Chives are easy to grow and only need moist soils with moderate nutrient levels. Mulch around the chives every year to bring new nutrients to the plant and keep the roots evenly moist. No other fertilizing should be necessary. Chives grow like a clump of grass and develop flower balls of different colors in the summer. Flowering will not hurt the plan to enjoy the color in your garden. To harvest chives during the growing season simply snip off the amount of leaves you need, they will grow back. The entire plant can be cut to the ground and it will reproduce leaves quickly. Chives can be preserved by freezing or drying. To freeze, first wash the chives and pat dry, then snip in small pieces and pack in bags, making sure to press all the air out, and freeze. To dry chives, first wash them thoroughly then place them in a dehydrator or oven at 110 degrees F (43 degrees C) for 4-6 hours. Store dried chives in a glass jar. Dried chives make a great addition to soups and salads, or as a garnish.